Edmond de Rothschild Group is committed through its strategy to support the shift to a sustainable, low carbon economy and to contribute to the realisation of the UN Sustainable Development Goals (SDGs). 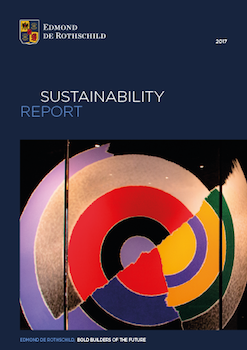 The Group’s fourth annual Sustainability Report illustrates its new brand positioning, “Bold Builders of the Future”, and gives a complete overview of its performance and progress versus its 2020 Sustainability objectives, across its Private Banking, Asset Management and Private Equity activities. The report also highlights how its strong convictions and deep collaboration within the company and with external stakeholders can create opportunities, drive innovation and result in pioneering responsible investment solutions. The Group is a member of the United Nations Global Compact since 2011. This report was prepared by conforming as much as possible to the Global Reporting Initiative standards. Key performance indicators were verified by PricewaterhouseCoopers, a member of the PwC international network. * The Edmond de Rothschild Foundations are a network of 10 private foundations under the leadership of Ariane and Benjamin de Rothschild. They are entirely separate and independent from the Edmond de Rothschild Group. In 2017, over 30 projects have been supported and developed by the Edmond de Rothschild Foundations. To find out more about these and other projects click here.